The summer heat is driving everyone crazy! This is why most folks go to the mall to cool off. What better way to bring in the summer vibes minus the heat of the sun with this week's #MondaysMadeBetter Ice Blended drinks from CBTL! Today, May 15th, the Mango Ice Blended® and Sunrise Ice Blended® are available ALL DAY for only Php 100 each! The chance to win Php 1,000 worth of gift certificates is yours when you share how you celebrate your day with an Ice Blended®. 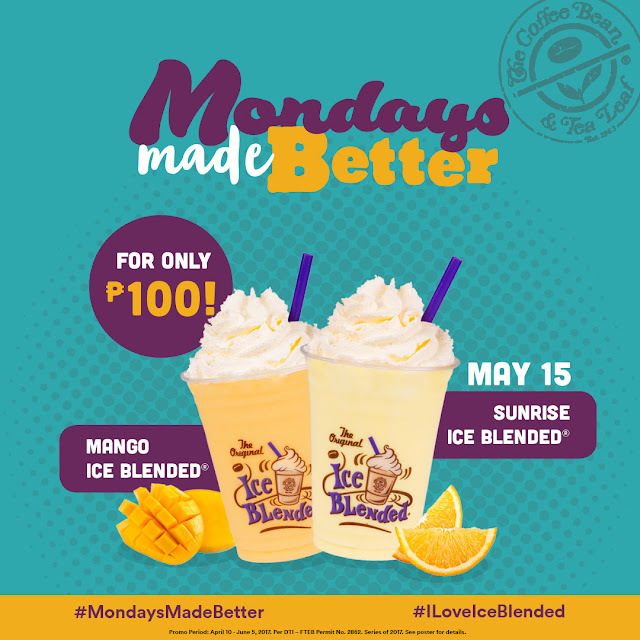 Just tag #MondaysMadeBetter and #ILoveIceBlended when you post your creative entries on Facebook or Instagram! You may also get the chance to win a year’s supply of Ice Blended® drinks when you join at least four (4) Mondays, so hurry and send in your entries! Here’s an exclusive treat for our Swirl Rewards card holders! Double your Swirl Rewards card points when you buy the featured Ice Blended® of the week!